We use the state of the art ‘Gutter Vac System’ for safe and reliable gutter cleaning in Leighton Buzzard. 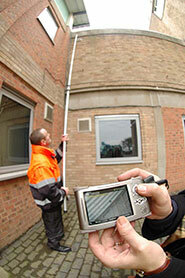 Using pole mounted cameras and vacuums, we are able to survey and clean the gutters in less time, so saving you money. We operate from ground level up to 45ft high using the latest camera technology for a controlled clean of your guttering. We use a high powered cleaning vacuum to remove moss, weeds, leaves and just about anything else that lands in the roof gutters. Where the reach is beyond the Gutter Vac System, we can utilise hydraulic platforms or other access methods. This fully complies with Work at Heights Regulations 2005. We advise our potential clients to commission a full camera survey of the buildings guttering system. Our quotation is then based on cleaning only the areas of guttering that require attention. This method ensures you are charged only for necessary work and not charged for unnecessary access or cleaning. Blocked gutters prevent water draining away from the building which can then seep into the buildings foundations potentially causing more expense. Blocked gutters can become heavy from the extra weight of dirt and water which can cause your guttering to pull away from your fascias, and in some cases fall from the building completely. Leaking gutters or water overflowing from blocked gutters can run down walls causing them to become damp. When it comes to looking after your guttering, you can rest assure that you are in safe hands with DMC.